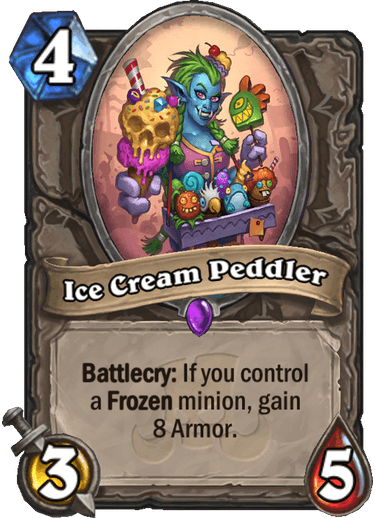 Hearthstone did their reveal dump of new cards last week, including ‘filler’ cards. What’s surprising is that the filler cards are actually interesting this time around. In the past, and with many card games including Magic the Gathering, filler cards can be boring. In Hearthstone they’re usually minions with mediocre stats, and either no card text or only combat keyword abilities like taunt. At peak new-set excitement, just before release, these cards almost feel like a let down. Often even more so when opening them. But with the upcoming Rastakhan’s Rumble set things feel different. There are still filler cards that are obviously too weak to ever see competitive play. But most or all of them at least give you something unique to think about. That’s a huge improvement. It keeps excitement high for the set, and gives newer players and experimenters alike more to have fun with. So how’d Blizzard do it? The filler creatures still have poor stats, but have accompanying abilities that have potential for synergy beyond just standard combat. 4-mana 3/5s are a common, generic stat-line that gets used a lot. The stats aren’t enough to get played for that alone, but are good enough that they’re never paired with a truly powerful ability that would warrant being played either. Yet the 3 that appear in Rastakhan’s Rumble are at least unique enough to get tinkerers tinkering. 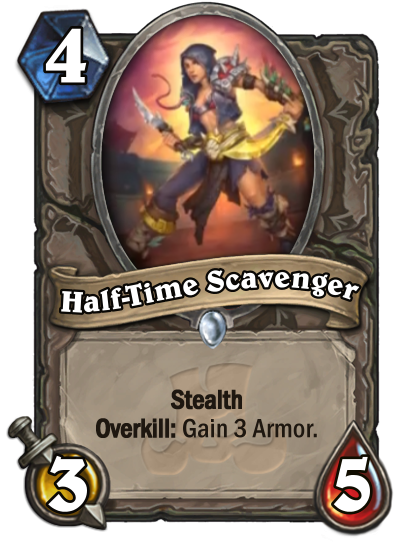 Half-Time Scavenger can potentially get you ongoing value. Weak value on its own. But since it’s paired with stealth it lends itself to being safely buffed. All of a sudden its 3 attack + Overkill doesn’t seem like a bad pairing. 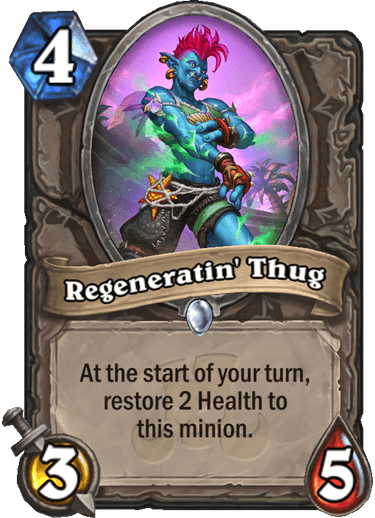 Regeneratin’ Thug is similar. It’s not a huge effect, but anything that repeats has potential. And Hearthstone has many effects that trigger and synergize with healing. In both cases you’re likely spending 2 cards to get the engine rolling, so the power level is still weak. But they both open up possibilities that even stronger cards cannot. Icecream Peddler takes a different approach. Its effect is actually so strong that if you can guarantee it, it’s better in every way than Antique Healbot, one of the best and most commonly used cards in Hearthstone in its time. The catch is Icecream Peddler has an incredibly difficult condition to its power. It’s one you can’t rely on an opponent to accidentally setup, and doing it yourself weakens your position in the game. As a result, another really weak card, but also a unique one.